Music, a good book and maybe a glass of wine or two. This place has been photographed often and I’m not at all tired of looking at the pictures. Insight Forest is a photo exhibit and well worth a visit. I don’t actually fish, I just like to rest here. These are photos of the four new outfits I got at Buddy Walk, which will continue through the end of the month. Usually I don’t enjoy shopping so when the energy and time was available to look through all the shops, I made the most of it and I’m really pleased with my selections. The back of this Pearl River Gown by [SAKIDE] is lovely as are the details, which don’t show so much in my clicked snapshots, which is how I do SL photgraphy. I wore this Saturday evening at a masquerade party at Basilique, which I very much enjoyed. Early on, I noticed my ankles were missing and then switched to the “with feet” version which solved that. The gown is also available in white and red. One of the reasons shopping was easier was because I was also in IMs with someone I hadn’t seen for ages since we were in Victorian roleplay. We talked for hours and later I showed him some amazing places, the one above being Insight Forest. The outfit is a: lilitha: blue. It’s also available in a reddish orange print. Later I wore a smaller size than the one in the photo above. There was a NC about the possible need for tinting pasties to skin color, which I didn’t feel like messing with but it really wasn’t necessary for this avatar, even with the smaller size. The [SAKIDE] French Touch Skirt I bought also includes a white skirt with black dots. Also available is a red/white set. The top is [SAKIDE] Spencer Lace Shirt which is also available in black. When I was walking across the mall, I chanced upon this bear which is free so of course I took a copy. A girl never knows when she might have use for a bear. This is the Sarasota Sleeveless Dress by *Citrus* and I really like it as well. I’ve been watching season three of Mad Men on DVD and I might be influenced by the styles I’ve been seeing. This was a fun and painless way to get some new clothes, which are very reasonably priced and it’s for a worthy cause. It was easy for me to get around and I had no problems with lag. The fashion bloggers have wonderfully shown some of the creations at SL Buddy Walk. Recently I wandered through the whole area in the wee hours of the morning and saw two sets of furnishings I really love. My inventory is full of decor items I’m not using so I didn’t get these and bought clothing instead. This set is beautiful and I really like the two antique portraits included. I can’t find my notes about who created these and I don’t know if the Buddy Walk items are still available elsewhere after the end of this month. The snapshots are here though and that will do for now. Tomorrow I’ll post photos of the four outfits I bought and I’m patting myself on the back for having the patience to try them on and take pictures. My Avatar Mix from the Meta_Body Project. There are only about six components from the first set of avatars here; I’ve not created any of them. It was a bit of luck and coincidence that I found this frame-like object to “sit in” and I’m really pleased with the look, although the photo could be cropped for better composition. As always, you can click on the photo to see it larger. This is on midnight setting. I had created a male alt to play with these since Pearl has been complaining about frequent costume changes for some time. The basic free male AO made for some odd poses. The above photo is with the Framegirl shape which is a little more substantial but I like the Metabird shape for this avatar the best. If anyone really wants my “recipe” for this avatar, let me know in the comments and I’ll look it up. I’ve been stretching myself thin in both SL and real life lately. It was quite a help to take most of these photos within a few days time and schedule the posts in advance. 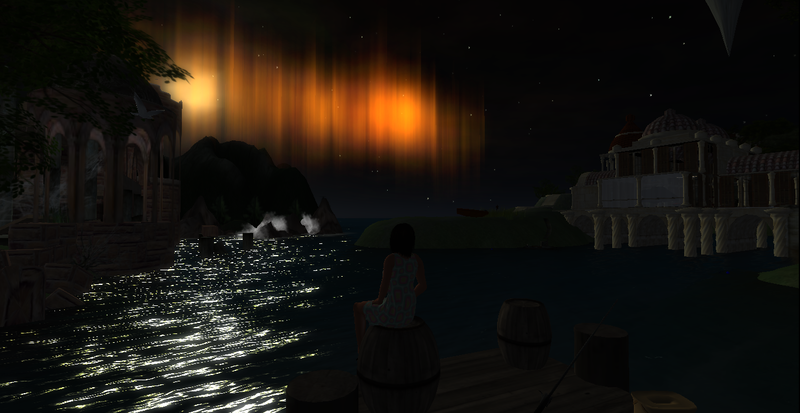 This project is one of the most enjoyable and insightful that I’ve looked into in SL; I’m pleased I have a record of my experiences in these posts. I intend to return to mixing a few more components in the future. Only one more of these avatar photos from me and it’s the one I assembled which I’ll post tomorrow. 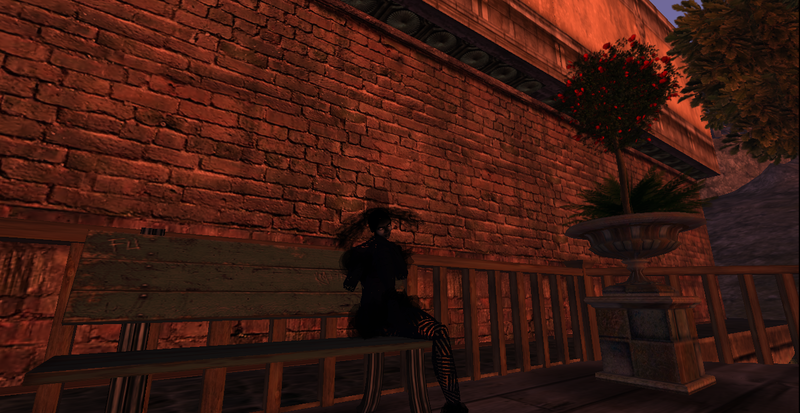 It’s been great having these posts scheduled; when I’ve had time to be inworld lately I’ve been more relaxed. I’ve never posted every single thing I do of course, but sometimes having no purpose at all feels good. I’m not sure if I’ll be blogging less for a while or what. Some things I might write about I would likely regret later. From time to time I become indifferent about technology and want to be outdoors a lot more, which has been happening lately. I’ve also felt more annoyed with people and when that happens I think it’s time to step back. Happy first day of spring in the northern hemisphere. The avatar above is one of my favorites. I love, love, love the horns. This is the first time I’ve considered wearing horns and I want to use them in an avatar that I’ll mix together soon. I don’t recall there being a skin with this one so I used the one was in the previous avatar I tried on, which happened to be Can’t Stop Dancing. It is an elder skin. It’s possible the creator of the Christina avatar used that skin as a component; I wasn’t taking good notes. As a reminder, these avatars can be collected from this wonderful project. I’m sure you have room in your inventory, right? I enjoy seeing animals in Second Life. The avatar is sitting on a crescent moon that you can buy. I just point my camera and shoot and this moon is way cooler than it shows in this photo. It’s almost 4:00 a.m. here as I edit this. 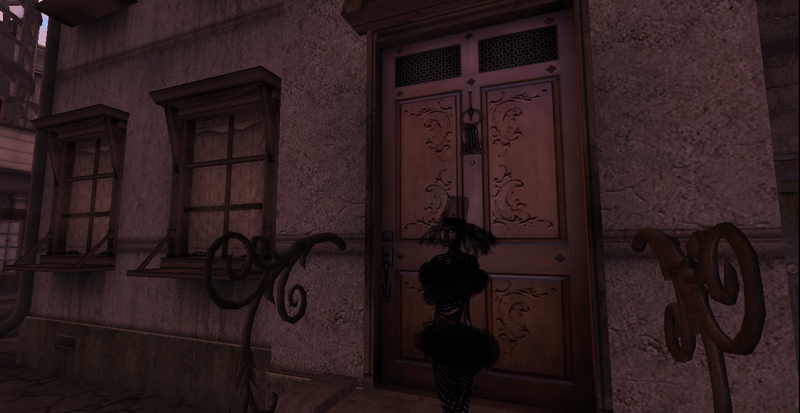 I’ve just spent hours dancing and chatting with an old friend from my Legacies 1891 roleplay days. This is something I don’t do often anymore. We were both procrastinating on projects we were working on, instead going to Midsomer Meadows wearing our totally different style outfits; I had bare feet and he wore heavy boots. Our rp characters shouldn’t plausibly have been friends; his was quite dangerous but Pearl charmed him and so we ended up chatting OOC instead of Pearl getting murdered. Tonight I also got a little tarot reading which was very illuminating; we had fun with no agenda, just two people behind avatars taking time for each other and chatting from different sides of the world. Who knew I’d like hats so much? I like them better than the shoes in SL.